"Where are we going?" Key asked, walking out of the front door. "Lotte World! Now come on!" Jonghyun yelled from the other side of the driveway and Key nodded, quickly running back inside the house to grab his coat. The drive was about two hours long, but it went by quicker than he expected. They were both singing along to songs on the way, so the time flew by. Key gulped - he wasn&apos;t good with heights, and he had told the other members that enough times for it to get stuck in their heads. "Are you okay?" Jonghyun asked, stopping to face Key who couldn&apos;t stop staring at the ride and grabbing his hand. "Yeah... Just a little nervous. I haven&apos;t been to a theme park since, well, before SHINee," I muttered, as if it was a terrible thing to say. "You&apos;ll be fine! I&apos;ll protect you," Jonghyun grinned, continuing to walk ahead, dragging Key by the hand. They went on every single ride in the themepark, even the Fireblaster, though it took Jonghyun a good twenty minutes to convince Key to even step up to the queue. And though Key hated to admit it, he actually had a good time. And now they were on their way out of the themepark to grab some food. Jonghyun had suggested going to a restaurant inside the park, but Key had protested, saying that it was far too expensive. So they made their way to a Lotte Mart, just around the corner from the themepark. As soon as they entered the building, Jonghyun ran off out of sight and Key couldn&apos;t help but smile at his friend&apos;s silly behaviour. "Hide and seek, really?" Key laughed, pretending to disapprove. "Where are you, Jjong?" Key darted from aisle to aisle, ignoring the odd looks from the other customers. Key could just hear faint giggling coming from the toiletries ailse, and decided that it was simply Jonghyun being childish. He went to search around, only to find Jonghyun hiding behind toilet paper rack. "Found you!" Key snuck up behind Jonghyun and whispered in his ear, causing Jonghyun to jump up and knock all of the toilet paper over. "You almost gave me a heart attack, hyung!" Jonghyun yelled, but he coudn&apos;t control his laughter. "I&apos;m sorry!" Key managed to say through his laughter. When the two boys had finally calmed down, they picked the toilet paper packets back up and placed them on the shelves. They payed for the food and walked out of the store, but as soon as Key reached the car to put the shopping away, Jonghyun called him over to where he was standing across the street. "C&apos;mon, Key! Let&apos;s rent two," Jonghyun grinned, motioning towards the bikes, but Key only rolled his eyes. 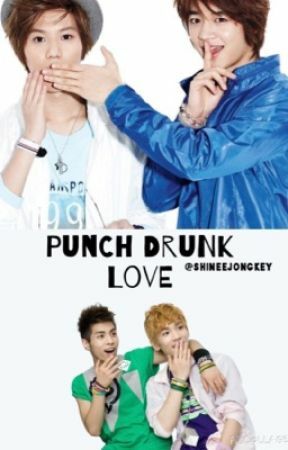 "It&apos;s getting late, Jjong, and I want food," Key whined, reaching for the car door with the shopping still in his hand. But Jonghyun held up the car keys and locked the door, dangling the keys in front of him. He called Key over again, hopping from one foot to the other. It seemed his hyper mood wasn&apos;t about to wear off just yet. Key finally gave in, and soon they had paid for two bikes for the rest of the afternoon. "Get on, then," Jonghyun said, putting the food Key had been carrying in the basket in front of the handle bars as he peddled off. Key was soon close behind. They cycled along the city roads for about twenty minutes before pulling up to a park. Key could see a lake off in the distance, and the whole area was filled with bright flowers and autumn leaves that had only just fallen off the trees. "Wow," Key breathed, taking in his surroundings. "This is beautiful." Key gazed at the lake and the swans in awe. "I know, right?" Jonghyun was clearly proud of his findings. "Now, come on. You were complaining about being hungry, and now I am, too." Jonghyun rolled his bike towards the lake on foot until they found a clear grassy bank for them to eat their food on. They ate in silence, taking in the breathtaking scenery. "How did you know this was here?" Key asked finally, wiping the crumbs off his mouth. Jonghyun just shrugged with a smug smile. "I didn&apos;t. I was sort of hoping that we&apos;d come across something while cycling and I guess I got lucky with this." There was a playful glint in his eye as he finished off his sandwich. Then Key felt something slimey attack his face. Jonghyun was holding a can of Silly String in front of him, trying not to burst into laughter. "Where did you get that?" Key yelled, trying desperately to wipe the stuff off his face. But Jonghyun was already holding up another can with a smirk on his face. "Oh, it&apos;s on," Key grinned, getting to his feet along side Jonghyun. Key sprayed him back, getting it all over his clothes and hair before Jonghyun could react. "You did not," Jonghyun glared at his shirt, but glanced back up at Key with the same goofy smile. "Oh, I totally did," Key said, his inner diva showing. They spent a good ten minutes chasing after each other, having the craziest silly string fight ever, but soon the cans ran dry and they were lying on the grass again, out of breath but still managing soft laughter. "Are we going home?" Key asked, sitting up. But before Key could get to his feet to reach his bike, Jonghyun pulled him back down and kissed him. The kiss was sweet. Unexpected, but gloriously sweet. If they had been in a movie, a heavenly chorus would have been playing in the background. But they weren&apos;t, and all Key heard was the thudding of his heart and the trees swaying. Key could have died and gone to heaven. Right then and there, all his dreams, his wishes and all of his greatest goals had either vanished into thin air, or had been answered and achieved. And judging by how Jonghyun&apos;s breath caught and the way his eyes widened before flickering shut, Key knew he was feeling the same. Key had been almost waiting for this, and even though it had barely been a day since the last kiss he shared with his Jonghyun, this kiss felt like the first but in a completely new way. A good way. Key was having a hard time remembering what his life was like before Jonghyun entered it - dull, probably. A deep warmth spread throughout Key, all the aches and pains of being rejected by Jonghyun disappeared and dissolved in that moment. Key felt a tear slide down his face, portraying the perfection of the moment. Jonghyun pulled away as he felt the touch of the tear on his own cheek. "What&apos;s wrong, Key?" he asked softly, cupping Key&apos;s head with his hand and lifting it so he could look into Key&apos;s eyes. "Jonghyun... I--" but he couldn&apos;t get those words out: his tears were choking him. He couldn&apos;t say it, not matter how much he wanted to. He wanted Jonghyun to know that he meant to world to him, but when he opened his mouth, he could only let out a small sob. "Key," Jonghyun whispered, tears coming to his own eyes. Had he done something wrong? Jonghyun wrapped his arms around Key, rocking him back and forth as he whispered comforting words. They sat in silence as Key calmed down, enjoying the evening air. Jonghyun kissed Key&apos;s cheek before standing up to return the bikes. Unwilling to leave the beautiful park, Key followed with his head hanging low. If he was unable to say a simple &apos;I love you,&apos; how was his Jonghyun supposed to know how he felt? They returned the bikes and drove back home in silence. But it was a peaceful silence, and a silence that spoke the words that Key could not.